Ever since they released their debut- The Healing of Harms in 2006, Fireflight have been a mainstay in the Christian rock world. 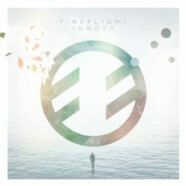 Nine years later and five albums in, the band has released Innova, which features a different sound than longtime Fireflight fans may be used to, though they’ll still feel right at home. Fireflight have always been ones to pay close attention to more than just the music. Their message is always one of positivity and encouragement- and a strong one too. With Innova, the message is stronger than ever and the band is back to make a statement. Musically, this is- as mentioned earlier- is a far cry from what fans may think they know from Fireflight. Instead of hard-hitting rock anthems like albums in the past, the band has gone down the electronic road. While some bands in the past have made such a change and failed miserably, Fireflight have found a way to make this transition and keep the essence of what they’re all about. The electronic elements of Innova are infectious to say the least. Innova is loaded with electronic, poppy arena anthems that will be stuck in your head and you won’t be able to get them out- not that you’ll want to anyway- “Lightning” being the highlight of the album- both lyrically and musically. It’s rare to find an album that flows so well that you don’t realize the end of the album is coming, but this is one of those albums. You’ll listen to it in its entirety over and over again. While they’ve changed their sound up quite a bit with Innova, the band has completely reinvented themselves. When all is said and done, this could be considered one of their strongest albums and will stand out from the rest of the pack in 2015.